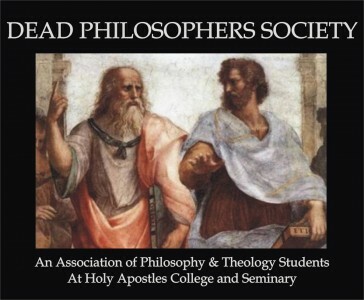 Established in the fall of 2006, the Dead Philosophers Society of Holy Apostles College & Seminary seeks to strengthen the community of learners within the philosophy and theology programs. Membership is free of charge and is open to all undergraduates, graduates & friends of Holy Apostles College and Seminary. Encourage all members to join the American Philosophical Association and/or the American Catholic Philosophical Association. By plugging ourselves into a national association, we help establish a common discourse. Encourage all members to engage in dialogue outside of any given course by providing a forum for the exchange of ideas and facilitating periodic meetings to discuss issues and problems of mutual interest.